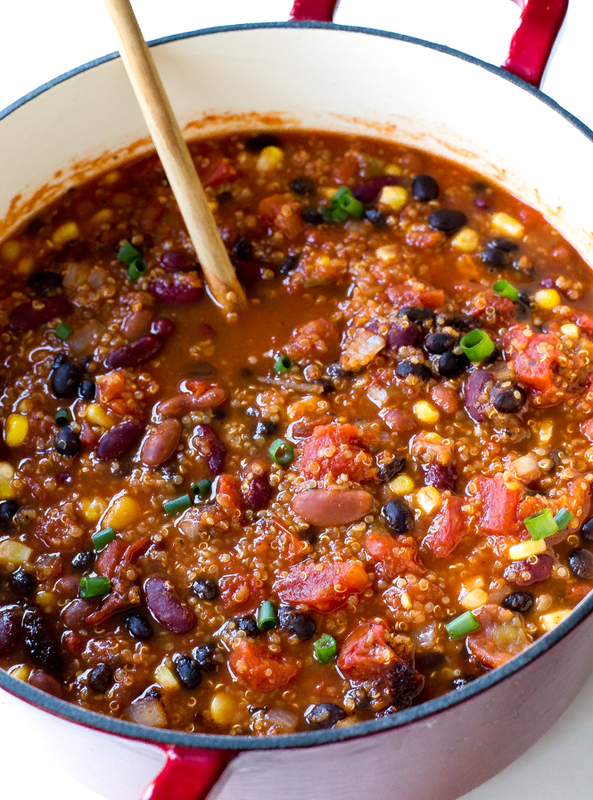 A Super Healthy Vegetarian Quinoa Chili loaded with three different types of beans, corn and quinoa. 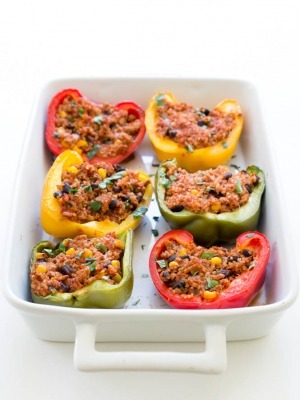 Hearty, thick, filling and full of flavor! I love a good chili. Especially one that is healthy and loaded with fiber. I packed this chili with three types of beans, quinoa, corn, onions and garlic. You will not miss the meat in this chili! This chili is super easy to throw together and only takes 10 minutes of prep time. 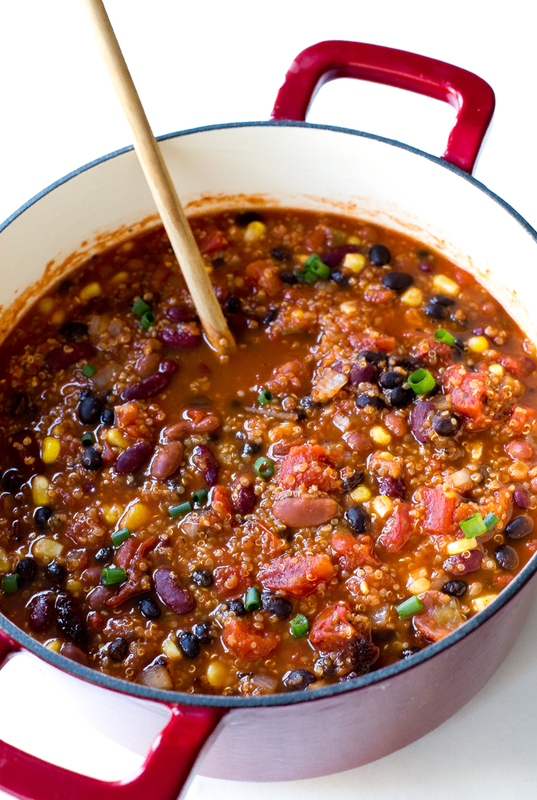 This chili also makes tons of leftovers and is freezer friendly! This chili is loaded with flavor, filling and hearty. I threw in some chili powder and paprika for added spice. I also like to add a couple dashes of hot sauce. But that can be omitted if you don’t like a lot of spice. 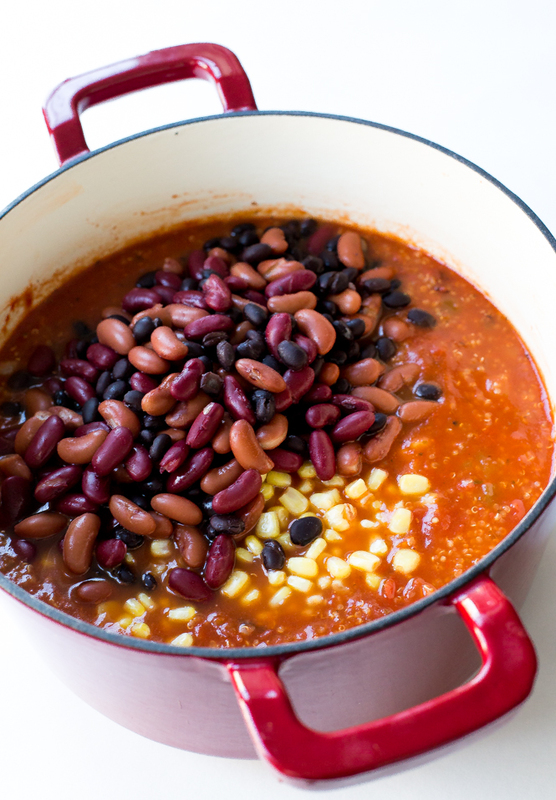 This chili would be perfect to serve for superbowl or during the colder winter months! Add in onion and saute until tender, 3-4 minutes. Add in diced tomatoes, crushed tomatoes, cooked quinoa, water, green chiles, chili powder, cumin, cocoa, paprika and hot sauce. Season with salt and pepper to taste. Add in all of the beans and corn. Cook for a couple of minutes until heated through. Serve immediately with shredded cheese, sour cream, green onions and avocado for serving, if desired! That looks fantastic! 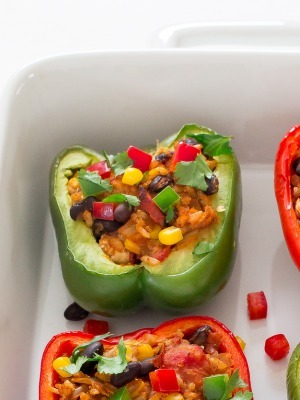 I am on a total quinoa kick lately so I need to try this! Always good to have a few vegetarian recipes up your sleeve as well. 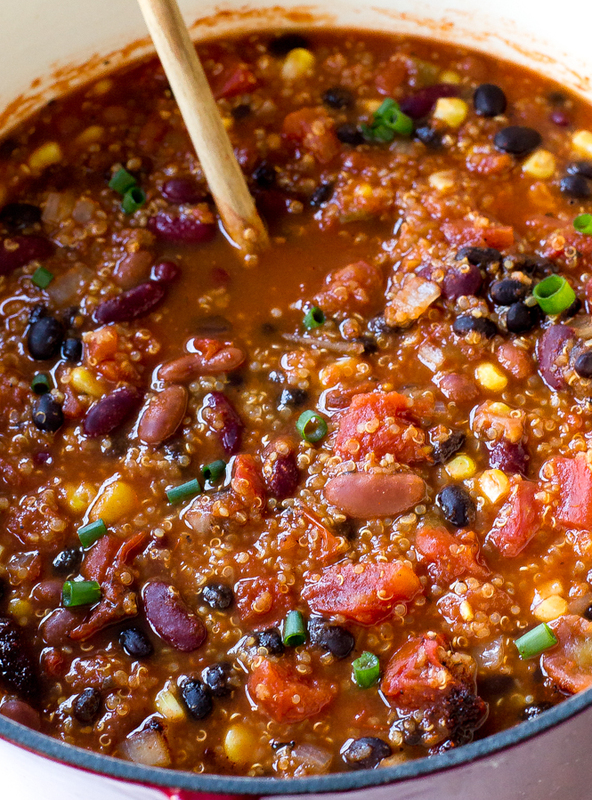 I love adding quinoa to chili — it’s such a great boost of protein! I am definitely going to have to try this with the cocoa powder — that’s something I’ve never added to chili! looks so comforting! Love it! Pinned! Sorry about that! It should say crushed tomatoes. I have fixed the recipe. This looks delicious! I plan on making it soon and was wondering if you recommend making any changes to this recipe if I use a total of 2 cans of beans instead of 3 (we don’t like a ton of beans). Thanks so much! That is fine you can always add in more corn or another veggie if you’d like. I think the chili will be fine with a little less beans. This was soooooo good! Such a simple and delicious “chili” I plan on making this again, but will leave out the corn. Such a great meal for Lent. The recipe sounds good but I am concerned over the number of processed canned items you list. Perhaps you could give measurement for dry beans to use to equal the canned beans. The extra time to cook my own beans is well worth it. Plus canned tomatoes contain lots of salt and you then state add even more salt, I would make sure to buy salt free or use my own home made tomatoes. Also roasting green peppers and seeding is a quick process and the fresh taste is so much batter than the canned type. The combination of flavors is good and using unprocessed items should only enhance the meal. Thank you for the idea. Lois, 2 cups cooked beans = 1 can of beans. Could you not put this in the crockpot (and use uncooked quinoa? ), for 8 hours on low? Yes that should work! Let me know how you make out! This was amazing! Both my kids, 6 and 15, loved it as well! It’s for sure our new cool-weather go to! Thank you for this healthy fave that we can ALL agree on!! Yes this can be frozen! Rather than cook the quinoa separately, I wonder if it would work to add uncooked quinoa to the pot (maybe with more liquid)? I have not tried this myself but I don’t see why it wouldn’t work! I would simmer until tender and add a bit more liquid because it will soak some of it up. We made this last night. Awesome!! I really appreciate the fact that no added salt is necessary, the vinegar does the job. Thank you for the excellent recipe. We’ll be making this on a regular basis. So glad you enjoyed this Marc! I love this recipe and is a go to for me anytime I want chili. This is a great vegetable soup. Being from the deep south I wouldn’t call it chili but it is a great thick and hearty soup. We added a bit of shredded cheese and some low sodium corn chips to it (thinking it would be more like chili) but its still great and it makes a lot! We’ll be eating on this for a couple of days! Oh man, this was DELICIOUS! Simple and easy prep, just hung out for it to simmer. Loved loved loved! Also – you say to serve immediately, but do you think it’s ok to cook ahead and then reheat? Thanks! You can always cook this and reheat! Also this is gluten free!